Colour: White, Red, Yellow, Blue, Orange and Green. With the help of our rich industry experience, we bring forth an exclusive range of PVC Helmet Beading. This product range is designed and manufactured by our skilled professionals using quality tested factor inputs and high-end technology as per the set industry norms. In addition to this, offered product range can also be customized as per the specifications detailed by our esteemed clients. We offer PVC Helmet that is made from light weight and high density Polythelene thermo-plastic having high impact and chemical resistance. The quality of our PVC Helmet is approved by BIS : 2925 and DGMS. It is in great demand as if has easy clip-on of Earmuff and Face Shield that offers total comfort. 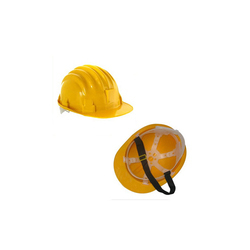 Our range of Safety Helmet PVC & Cotton Fitting are made up of injected ABS molding process. These are used in diverse industries and also for general usage. Furthermore, our range can provide safety and comfort to the end user. We have highly acknowledged organization engaged in presenting a remarkable range of PVC Safety Helmet. 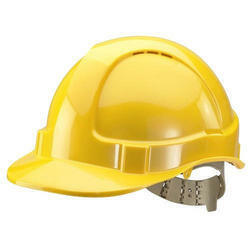 We offer PVC Safety Helmet. Being a quality conscious entity, we are committed in providing the best quality product. Checked on various quality assurance procedures, these product are known for their sturdy construction and compact design. Being a well-distinguished company in the market, we are into offering PVC Safety Helmet.